This Braised Beef (Chowking style) is just like the braised beef I ordered at Chowking. Exactly the same goodness and its super delicious. The only thing that differs is that I can eat it all I want. Compared to the fastfood, the serving is too small. Great for any occasion or party. You can even make it ahead and boil the beef until tender for 2hrs and cook it the next day. 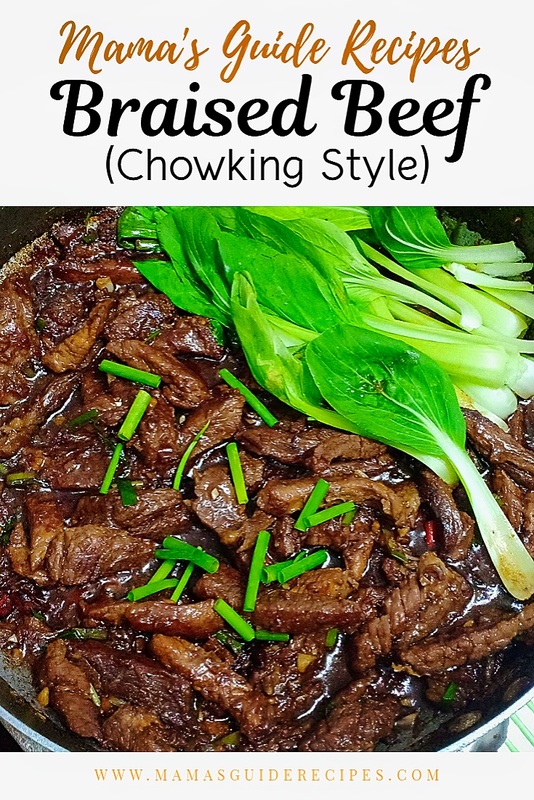 Its quick and easy to cook once the beef is pre-boiled and tender. You may always use a pressure cooker if you have one and skip the 2hr boiling I did. It only takes 30 minutes to make it tender in a pressure cooker once it starts to whistles. In a large pot of water, boil beef with salt, pepper, bay leaves and salt for 1 ½ hours. Drain beef and transfer in a bowl. Do not discard the beef stock and reserve it for later. Set aside and let the beef air dry. In a large pan, heat oil to saute garlic, ginger, onions and red chili until soft and fragrant. Transfer into a plate and set aside. Get the beef and add in the flour and toss to coat the beef strips evenly. In the same pan, heat oil and stir fry the beef until brownish for about 5 minutes. Its best if you will do it in batches. Add more oil if needed. Season with five spice powder (ngohiong), star anise, sugar, salt, pepper, and add the garlic-onion-ginger mixture. Toss it together for a minute until all the flavors are well distributed. Adjust heat to high and splash in the 3 tbsp rice wine. Scrape the bottom and toss the beef altogether. Photo used in this recipe is Copyright to Mama’s Guide Recipes.